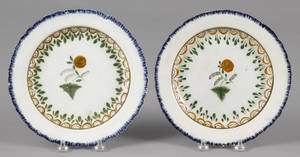 Three Modern 14kt Gold Bracelets. 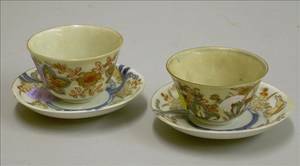 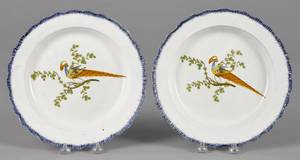 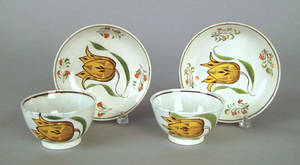 Pair of pearlware cups and saucers, early 19th c.
Pair of pearlware cups and saucers, early 19th c. , with yellow tulip decoration. 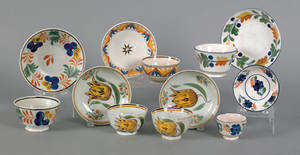 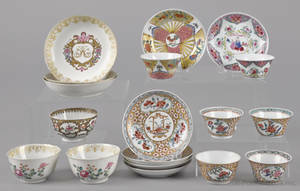 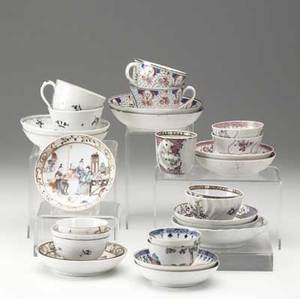 Archived auctions similar to Pair of pearlware cups and saucers, early 19th c.
Pair of Leeds cups and saucers, early 19th c.
Six Leeds pearlware cups and saucers, early 19th c.
Eight handleless luster cups and saucers, early 19th c.
Chinese export grouping of cups and saucers, probably 19th c. largest: 3" x 5"
Nine Chinese export porcelain cups and saucers, 18th/19th c.
Pair of pearlware blue feather edge plates, 19th c.